On the evening of the fifth of December Saint Nicolas and his helper Black Peter(Zwarte Piet) bring sweets and presents to children(small and large!). Of late this ‘tradition’ has received criticism because of the depiction of Zwarte Piet. Some people feel that his blackness combined with his servile role towards the white skinned Saint Nicholas creates a negative image of black skinned people. In addition Black Peter is often portrayed as a bit silly and sometimes even dumb character. This criticism has eventual resulted into a court hearing and the following verdict: Zwarte Piet is, indeed, offensive due to the character’s continued role in perpetuating negative stereotypes of black people(http://en.wikipedia.org/wiki/Zwarte_Piet). When I heard about the criticism of the role of Zwarte Piet I wanted to see if it was possible to argue both sides of the argument. So asked a few people their viewpoints and proposed that I would make a case against Black Peter and we would look at arguments for Black Peter.To my amazement it was fairly hard to discuss this argument in a reasonable way. One argument for Zwarte Piet is that is an old tradition. I was curious if that was actually true and therefore I looked it up in the wikipedia. As you can read for yourself: the tradition of probably started with a book in 1850 and in fact it took a while before it became the fest it now is. I. It might even be less older than that, because the way the celebration is portrayed nowadays(sage old kind man brings gifts from Spain by boat helped by a score of Zwarte Pieten) might be even less than 50 years old. Perhaps you don’t agree but this hardly seems like an old tradition to me.. But is tradition an argument in itself? If something wrong has been done for a long time, should we therefore keep on doing it merely because it is an old tradition? Another argument is that other things are worse or equalyl bad, but we don’t do anything about those things. One example that I was given is that there is slavery in India and China. This kind of argument I saw recently being discussed in a youtube movie by DarkAntics in reference to the ice bucket challenge to collect money for ALS. People argue that there is a more worthy cause to pursue. In other words: first make the rest of the world perfect before dealing with our imperfections. It is hardly an argument, as DarkAntics showed in his movie(https://www.youtube.com/watch?v=zDGu33F-mCY&list=UUTERzzbGZopw5SXJJr0tPyQ). Another argument is that it will cause the celebration to be abolished. As far as I know few want to abolish the whole fest, but some want to change the role of the Zwarte Peter character. Changing something is not the same as abolishing it. Can things be changed? Well, festivities and celebrations pop up, change and disappear over time. Take Valentine’s day for instance: “The rise of Internet popularity at the turn of the millennium is creating new traditions. Millions of people use, every year, digital means of creating and sending Valentine’s Day greeting messages such as e-cards, love coupons or printable greeting cards. (http://en.wikipedia.org/wiki/Valentine%27s_Day). Another argument is that the fest is not meant to discriminate. Unfortunately the court verdict says otherwise. It therefore is no longer a good defense. Arguments against Zwarte Piet are that the character basically makes silly funny person of a black man who is also a servant of a white man. It might not have meant to depict this relation, but it seems to do so and some people feel offended by this. And here is the human side of the equation. Let’s assume that a small fringe group feels insulted.. a very minor group. Should we keep on maintaining a partly fabricated tradition just because they are a fringe group? As said before.. culture changes all the time.. Carnival, for instance, was mostly a south Netherlands fest, which has spread towards the north. Things change and we could change things ourselves if we want too. We could change Zwarte Piet and still keep the celebrations. What I found annoying was that some parties immediately used this discussion in the recently held municipal elections. One of the examples is the OPA party.OPA is also the Dutch word for granddad(NOTE: this is the local party, not the national organisation for older people called OPA). The OPA party is a local party in town of Alkmaar, that produced the poster above. 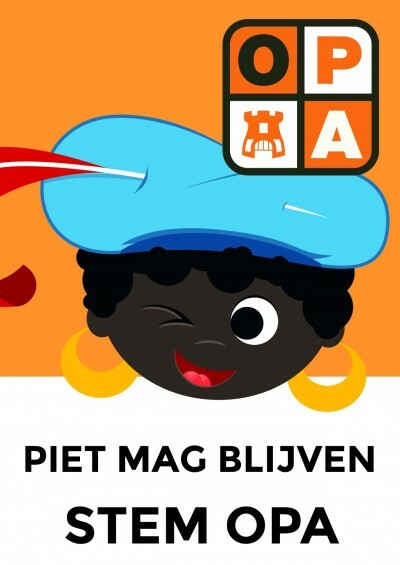 The text says: Zwarte Piet is allowed to stay. The poster is a wrong statement because a local party has hardly anything to say over such things, unless it is during the hiring of the people by the municipality to play out the characters. It is also a minor point for an election that is going to determine the political power structure of municipality of Alkmaar for the next four years and it would be really sad that people vote for a party partly because of such a trivial point. In addition the party has maneuvered itself in an awkward position considering the court verdict. The key word in the text is ‘mag’ which translates as: is allowed to or can. In other words this party tries to make politics by making a vague statement which promises nothing. And in fact they can’t hold their promise as the court has ruled otherwise. It all becomes even more silly considering that a simple background check would have told them that the issue was up in court just prior to the elections. It sounds like this party made a on the spur of the moment decision to jump on a popular bandwagon by making an ill-considered statement. Not only is the whole decision ill-considered but the sole argument they supply in their election statement is that it is an old tradition that should be maintained. As another simple background check would have told them: it is at best a dubious claim. The last straw that actually makes this argument shameful is the implicit bad joke, which might be intended or not(and if it is the latter it is certainly a bad one) Zwarte Piet, a black man coming from another country is allowed to stay, instead of those that come from other countries and who have to leave(because they are not wanted). That is morality at the bottom of the barrel: brings us gifts.. and you can stay. It is sad that some people can stoop this low. It seems however that it didn’t prevent OPA from becoming the largest party. 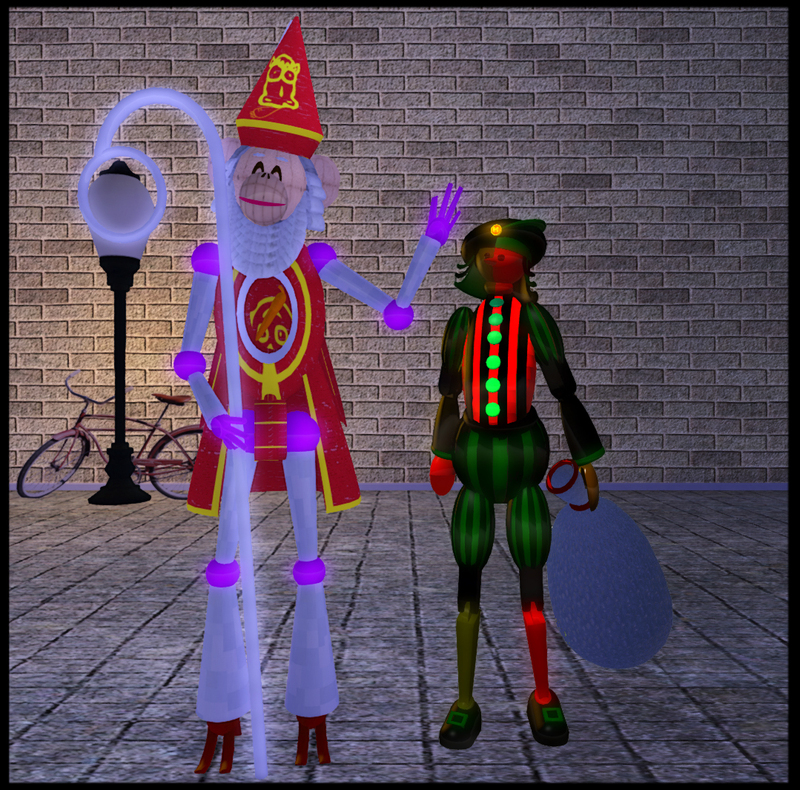 The picture that head the post show my Vel’s colorful Pete(I think Pete sounds better than Peter) and my SantaMonkey.